'Sugar and spice and all thing's nice, that's what little girls are made of', memories of rhymes we spoke when young. To conquer the picture fully thought we have to recollect "Slugs and Snails and Puppy Dog's tails, that's what little boys are made of". 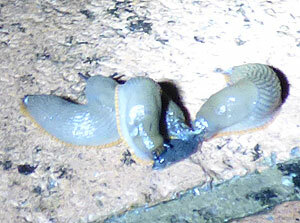 So the picture is clear, Slugs and Snails are ugly and slimy ! But, do they serve a purpose and not just a nuisance to humans, especially with Vegetable and Flower Gardens? They are Hermaphrodites, meaning there are a creature with both with male and female reproductive organs. They can actually mate with themselves but usually will find a partner to do so. 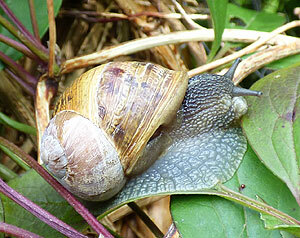 One Snail can produce up to 450 young one's a year. There are nigh on 100 species of all shapes and sizes. .It is very unusual for them to eat Flower's, it's the leaf they like, so their nuisance is only when a Plant relies on it's leaf for growth. In some European Countries they are a food source and as far as the natural chain goes, they will help clear a Pond of Algae and are a food for other creatures such as Hedgehogs and Chickens. One source say's the slime, if rubbed on to a Wart, has a very beneficial and curing effect. So, with 450 young one's being produced by just one every year, they will not be on the endangered species list for a quite a while I'm sure. A good diversion is also Dung and and any decomposing matter. If growing Potatoes, ‘Pentland Dell’, ‘Pentland Squire’, ‘Wilja’, ‘Charlotte’, ‘Golden Wonder’, ‘Kestrel’, ‘Estima’, ‘Stemster’, ‘Sante’ and Pentland Ivory are said to be less liked by them (source BBC). Both Slugs and Snails can be a real pest to us humans, but the best way to reduce the population is to attract their Predators to your Garden; Birds, Hedgehogs, Frogs, Toads and Slow Worms. Slug Pellets are the easy and probably most effective way but poisoning them will also effect the above creatures who eat them, especially Hedgehogs. So yes, they have some purpose, but not always a good one for us!